Quiet Section of World Famous Daytona Beach, Disney 1 Hour! Well-appointed, furnished Condo in excellent location and building. One quarter mile south of the Dunlawton bridge in Daytona Beach Shores (close to Ponce Inlet). Close to the drivable part of beach, but this beach has no vehicle traffic to worry about. All views are unobstructed by other buildings and is well-designed to not only see the Atlantic ocean, but to see the Intercoastal Waterway also. Large (1990 square feet), direct oceanfront, fifteenth floor condo with balcony and mirrored living room with wet bar and luxurious master suite. Building has a whirlpool and sauna. Secured building with garage parking. Large dining area and large breakfast bar. TV in every bedroom. Exquisite decor and furnishings. This condo has it all. Full-size washer and dryer in unit. Pets over 30 lbs. are not allowed. Many golf courses nearby. Located approximately within one hour of the Orlando attractions and the space center. Why stay in a hotel? Daytona Beach Shores, Florida. View virtual tour below owners Info. Wonderful condo. Great location. Spectacular views. The condo's owner is wonderful to work with and quick to respond. The condo is fully stocked with everything you need to have a great vacation. Owner is great to deal with and condo is spacious and beautiful! Love the views! We will be back! Thank you Joel! What a great place to stay.great response time from owner. 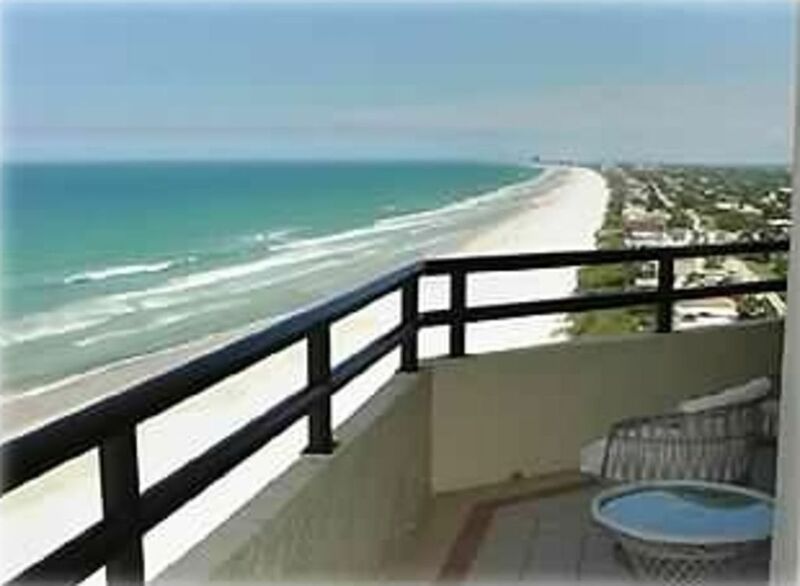 Very beautiful condo with views that you you never forget. It's far enough away from the strip to be peaceful and I enjoy the no drive beach. There are no condos to the south so you can see for miles and watch the Ponce Inlet light house. I have already reserved again for next year. We have been staying in various condos for years in DAB, and this one is by far my personal favorite. Foremost, the owner is an absolute dream to work with. He does exactly what he says he'll do, exactly when promised. And he doesn't hassle you, either. The place is spotless, thanks to a cleaning lady who is just great, and all the beds are upscale-hotel comfortable. We were pleasantly surprised by the 3rd BR having 2 double beds instead of 2 single beds like most of the others have. And the balcony was splendid -- large, with new furniture and seats for 4 -5! I'm writing a book and I may dedicate it to this balcony! On the 15th floor here, you look out the window and all you see is ocean! It's a nice walk to the Sunglow pier, and it was luxurious to have a car-free beach. You can rent beach furniture easily, but there's also a good supply in the condo. I've already booked again for fall and would love to go back in the summer as well. Fact is, I could live in this place. Wish I did.